The present Mitre building dates from around 1630, but there was an inn on this site since around 1300. It has always belonged to Lincoln College, and its name probably derives from the college coat of arms, which depicts the mitre of the Bishop of Lincoln. It was an important coaching inn, and as early as 1671 there were coaches running between London and the Mitre on three days a week. It is a Grade II* listed building (List Reference No. 1369357). It was in the parish of All Saints until that church was deconsecrated in 1971. It is now The Mitre restaurant & bar downstairs, and Lincoln College accommodation upstairs. 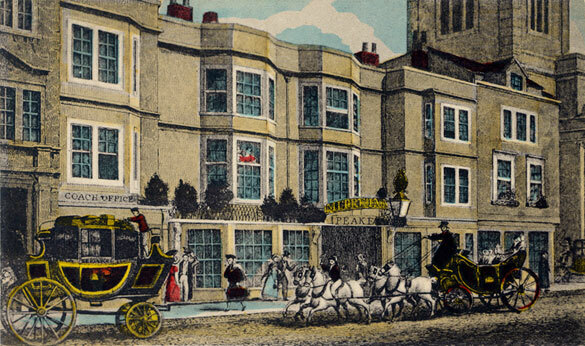 The coloured engraving of the Mitre Inn by J. Fisher shown below dates from c.1825 and shows the Defiance coach, which ran between Oxford, Henley, and London. From the Mitre Inn, High-street:- Messrs. Slater and Gray’s heavy-coach sets out every morning, at seven o’clock, through Henley, to the Bell Savage, Ludgate-hill, London, Sunday excepted; inside fare 14s., outside 8s. W. W. Sydenham, proprietor, at Oxford. Birmingham: Monday, Wednesday, and Friday mornings, at quarter past 11; through Shipston and Stratford, for 7 o’clock, trains to Liverpool, Manchester &c.
The Mitre was not as grand as the Angel, and probably catered more for people who arrived by public coach than those who came with their own horses. Nevertheless Anthony Wood records that when Prince Maurice of Nassau came to see the library and colleges “he layd at the Miter”. It was also popular with local residents, both town and gown, and in February 1691 Wood records how John Forster, Fellow of All Souls College, “died at the Miter Inn late at night, after immoderate drinking”. The 1851 census shows Arthur Venables, a widower of 59, who was then the hotel keeper, living at the Mitre with his unmarried son William. Only nine guests were in residence (but Sunday nights were perhaps quiet, and it was out of term): there were two solicitors, a linen manufacturer, a draper, and a young man of 22 of no occupation. Looking after these nine guests was a staff of 17: a barmaid, a housemaid, a china maid, three chambermaids, three waiters, a “boots & ostler”, an ostler, three grooms, and two general servants. In 1861 James G. Venables, Arthur's son, was the hotel keeper with his wife Sarah Jane, and there were eight guests, three waiters, a porter, a sitting room maid, two chambermaids, a housemaid, kitchenmaid, scullery maid and boots. In 1871 Mrs Sarah Jane Venables, now a widow, was the hotel keeper, assisted by thirteen servants. There were eight guests in residence. As can be seen from the above Frith & Co postcard of 1907, in the early part of the twentieth century the Mitre’s rooms extended over the market frontage. The main building is on the right, but its rooms extend westwards across the covered market’s frontage above Slatter & Rose. At the time of the 1901 census the live-in staff comprised a hotel manager, a housekeeper, two still-room maids, a linen keeper, four housemaids, a vegetable maid, a kitchen maid, a chambermaid, a kitchen porter, four waiters, a plateman, two porters, and a bookkeeper and office assistant. This staff of 22 had only three guests to look after (presumably Sunday nights out of term were quiet). In 1911 the widow Mrs Mary Foster (80) was the hotel keeper, and Miss Ada Marion Slater (48) the hotel manageress. Also living at the hotel were 21 other members of staff: the housekeeper, two bookkeepers, a linen keeper, a chambermaid, four housemaids, two stillroom maids, two kitchenmaids, a plateman, three porters, and three waiters. There were nine guests staying on census night. 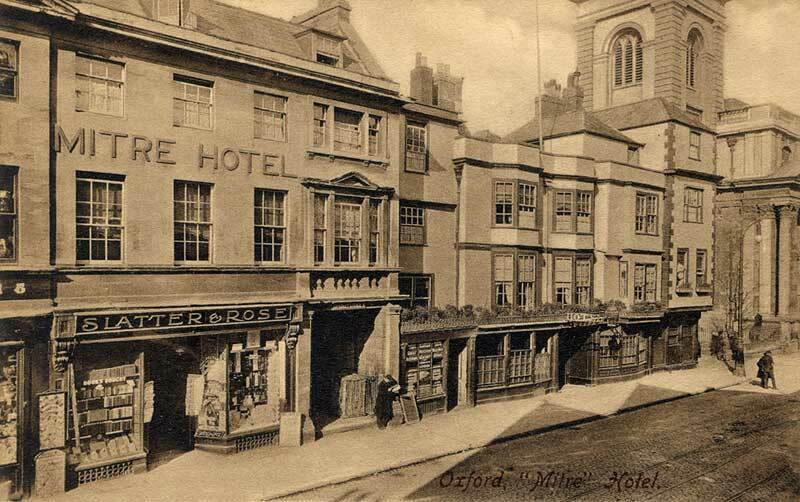 In 1926, the Mitre ceased to function as a coaching inn and became simply a hotel. The stables in Turl Street behind were converted into the Turl Bar. In 1967 the ground floor of the hotel was taken over by the Berni Inn chain and turned into a restaurant; and in 1969 the Mitre ceased to be a hotel altogether when Lincoln College took all its other rooms over to provide accommodation for 50 students. Whitbread took over the Berni chain from Grand Metropolitan in 1990, and the ground floor of the former hotel then became a Beefeater Restaurant. It is now The Mitre restaurant & bar. No. 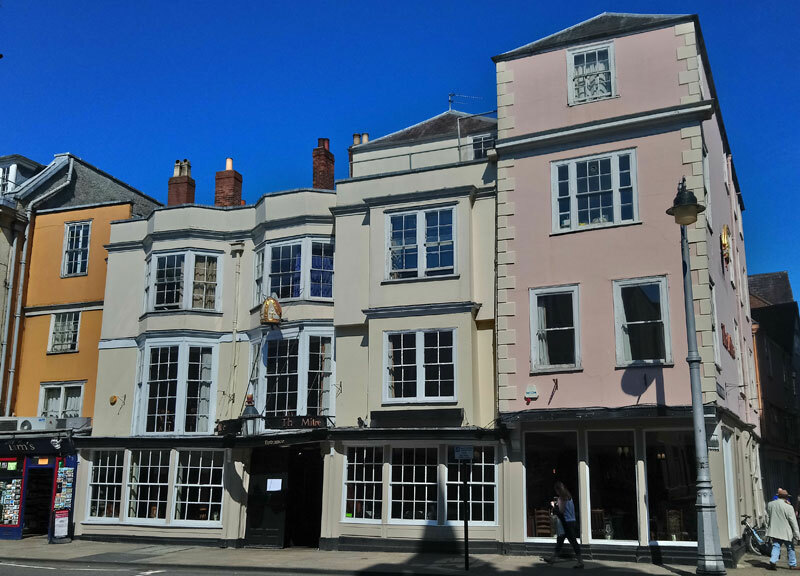 18 was originally the number given to the shop on the corner of Turl Street that is now part of the Mitre (on the right in the photograph above). It has an eighteenth-century front on an older building. It is jointly listed with the Mitre and the former coaching office to the west, and all are given the number 17. The 1851 census shows Richard Richardson, the tea dealer at this shop, living upstairs with his wife, six children, and four servants. In 1883 part of the premises of Thomas Sheard (the grocer at No. 21) in a court adjoining All Saints Church behind No. 19 was separated off and converted into a tutor’s residence for Brasenose College. It was allocated the number 18, which was going spare, but is now simply known as Brasenose House. 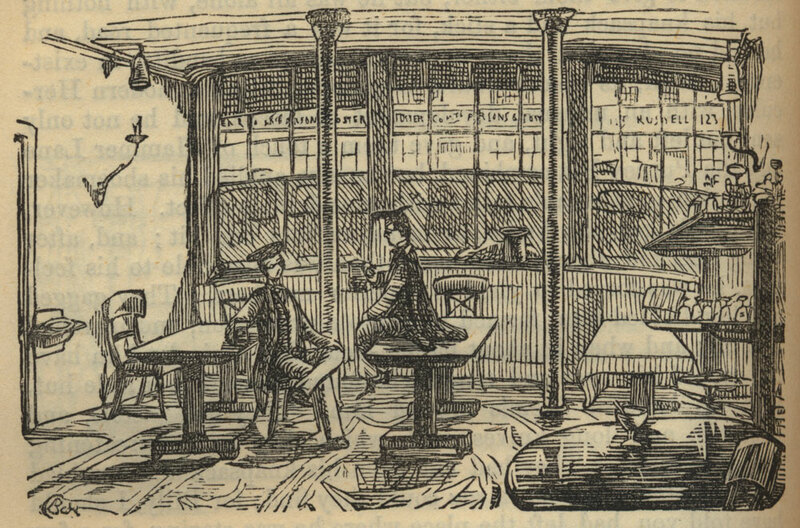 Left: Mr Bouncer and Mr Verdant Green in the coffee room at the Mitre, an illustration from The Adventures of Mr Verdant Green, published in 1853. The shops on the south side of the High that can be seen through the window are accurately named: on the left is Parsons & Foster, hatters, mercers, & tailors; Foster & Co, drapers & mercers, and James Russell's music shop (123, 124, & 125). In 1895 the Mitre absorbed the shop on the corner of Turl Street, so that its number, 18, became spare: in 1912 it was reallocated to Brasenose House, which in 1883 had been built behind No. 19 on the other side of Turl Street and All Saints Church. The Mitre today sometimes gives its number as 17 (but this belongs to the shop to the west that it used to have).